TREE HUGGER WINS. This is the first time the Nobel Peace Prize has gone to someone for working for environmental concerns. 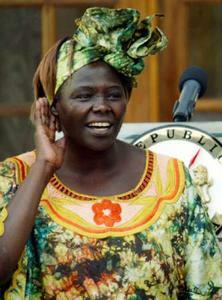 Kenyan Wangari Maathai's work is tied inextricably to local and international justice. Her efforts to oppose development exposed the strong-arm corruption of Daniel arap Moi's government. And the Green Belt network has helped many women become self-sufficient through the sale of saplings in a country that had become 90% deforested through rapacious development and bad wood harvesting practices.